Round 2 With “Closed Bathrooms” Tony Elliot? Wresting the $10 million from poverty pimps: Report on the HEAP, HAP, or COC HQ. Emergency laundry and shower access for the broader homeless community and Ross. Tenants in Trouble—demanding real data from the Task Farce, organizing with students, renters, elderly, disabled groups to establish mutual power and solidarity. SCPD: demanding revelation of surveillance devices throughout the City, police records on use of force, selective enforcement, tasering, DHS/ICE collusion, racial profiling. Protests to open the property room during regular SCPD hours daily. MHCAN: A New Regime with a new Executive Director? What changes now? Free Radio Santa Cruz still offers a reward of $300 for info leading to a 10′ X 10′ studio space with bathroom, internet, and electrical access–either indoors or out (we’ll build a structure). We’re also seeking a transmitter space where we can put up an antenna–a backyard, a multistory home, a high tree–help us spread the word. Help us so we can help you! Will the Watkins Minority-Rule at Council Force the Closing of the Ross Camp through Agenda Manipulation…Again? Speaking Loud Outside City Hall to the Homeless on the City’s Attack on the Ross Camp, RV’s, and Folks Outside 6:15 PM City Hall Tuesday 2-26-19. Bring Signs, Blankets, and Bodies. Challenging the Mayor’s Agenda & Council 7 PM right after. 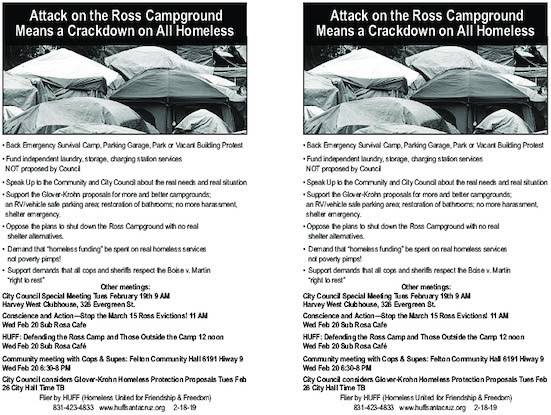 Ross Camp Runaround: Will the Council Stop the Destruction of the Camp Feb. 26th? Conscience and Action meets at 11 AM; HUFF meets at noon; times are flexible. Both meetings are open. Meeting with Martin the Mangler– suspend ticketing under Sleeping Ban-type laws. Organizing mass support for the upcoming February 26 meeting at City Council around students, immigrants, elderly, differently-abled, and youth groups and an attempt to reverse the February 12th Demolition of the Camp Decision. RV living elsewhere; polling and research with Cynthia and Alicia here. Update on Berkeley activists defending People’s Park against new attacks. First I would like to apologize for not getting back to you sooner. I have been down to the camp in the past few days and from what I have seen, it appears that things are moving much slower than what was suggested by staff. What we hope to accomplish with providing beds and shelter for homeless people and the reality of getting to the point where we can do so is often very challenging and can take more time than we anticipate. Given the pace at which we are moving, I am not confident that we will be able to provide enough shelter for our homeless population by the proposed closure date of the Ross camp and will recommend that we not close the camp until we have a clear feasible plan to do so with the least amount of negative impact. This week we will be having another homeless 2×2 committee meeting where I will be raising these concerns with the county supervisors, and both county and city staff. I will express to them the concerns of the community and inform them about how the March closure will not be productive and be detrimental to our community. My hope is that we will be able to come to consensus and if not, we will be able to appropriately address these concerns at the next city council meeting. Thank you all for your hard work, concern and for reaching out to me. The Heroes encampment behind the Gateway-Ross area is under threat of “abatement” according to resolution passed at the 2-12-19 S.C. City Council. The flyer here describes some actions discussed by HUFF (Homeless United for Friendship & Freedom). Recently Chief Andy Mills of the SCPD visited Ross Camp and gave stern warnings to campers that they would all have to leave by March 15. Some would have to leave town and not return. No future encampments of this sort would be permitted. Official-looking notices have already been posted (https://www.facebook.com/photo.php?fbid=10156853392903820&set=a.489759988819&type=3&theater). There are no clear records of any Ross campers being housed elsewhere as was supposedly offered by city bureaucrats Susie O’Hara and Tina Shull at Council on February 12th. Nor do Ross campers feel they want to leave for the proposed waiting lists, night-time only shelter, and other inadequate alternatives being spoken about (though not actually offered). One camp resident gave her chilling account of Mills’s threats at https://www.facebook.com/alicia.lusterkuhl/videos/2407437002622069/ with an additional short piece at https://www.facebook.com/alicia.lusterkuhl/videos/2407443555954747/. The federal Miller v. Boise decision, whose precedent is applicable here, bars cities from enforcing laws that criminalize sleeping, camping, resting, or lying where they have no shelter comprehensive alternatives. Conscience and Action and HUFF will be meeting Wednesday at the Sub Rosa Cafe at 703 Pacific next to the Bike Church 11 AM to 1 PM. Join us. NOTES BY NORSE: “Liberal” SCPD Chief Andy Mills showed up at the Ross Encampment last week around the time “Abatement” notices were being posted, to give warnings. Thanks to the key vote that killed a proposal to restore last year’s rent freeze and just eviction protection law, hundreds of Ross camp residents are facing loss of their lodging, belongings, privacy, and safety. New Councilmember Justin Cummings voted with the Mathews-Watkins majority to back a slippery City-County plan to offers phantom floor spaces and uncertain prospects of future shelter. Why? A cosmetic cover for the joint City-County “eliminate the eyesore” Ross Camp which prompts anxiety from nearby housed residents and tourist-seeking businesses at the Gateway Plaza. Cummings made an apparent promise on February 12th that the announced “abatement” might be altered at the February 26th or March 12th Council meetings if it became (even more) obvious that there was insufficient shelter to meet the needs of the Ross residents. However he also voted for the provision that allowed for closure notices to be posted immediately and has not responded to repeated requests tostop the forced eviction until real guarantees can be provided. Santa Cruz also uses the deceptively-termed “Homeward Bound” as part of its one-way-trip-to-nowhere plan to lawlessly deport homeless folks, often in collusion with law enforcement authorities, social service “providers”, business interests, and courts. This provides the charade with both humanitarian and legal cover. Last year’s Boise v. Martin decision makes laws that enable arresting homeless folks for sleeping, resting, sitting or lying likely unconstitutional here. The makeshift Ross Camp Community was created largely by the unhoused themselves. This was prompted in part by the shameless reduction in even token winter shelter space. In part by city staff betraying promises to keep open the small and cramped River St. Camp until next April (while actually closing it in October=–thank you City Manager Martin Bernal, Susie O-Hara and Tina Shull). And partly by the inevitable explosion of the local homeless population as rents escalate, jobs disappear, and services shrink. Police and rangers may have had a plan to use the camp as a concentrating device. Numerous survival sleepers report being (illegally) driven to the camp under (false) threat of arrest and property seizure. However, once there, saner and more compassionate heads in the community began to provide food and shelter support. The City and County were forced by the numbers to provide minimal portapotty, trash, and needle disposal services. Tomorrow (Tuesday February 19th) is a Special City Council meeting behind held at the Harvey West Clubhouse 326 Evergreen St. at 9 AM where there will be a brief public comment period (http://scsire.cityofsantacruz.com/sirepub/mtgviewer.aspx?meetid=1230&doctype=AGENDA). The Guardian article below documents how widespread the homeless-dumping practice is throughout the U.S. For more details, video, and commentary, go to https://www.theguardian.com/us-news/ng-interactive/2017/dec/20/bussed-out-america-moves-homeless-people-country-study . Brent Adams Says “Clear the Camp” and Do It Right. Bring Signs, Blankets, and Bodies to City Council’s Open “Retreat” 2-19-19 Tuesday at Harvey West Clubhouse to Stop the Ross “Abatement”. Wresting the $10 million from poverty pimps: Action at the HEAP, HAP, or COC HQ. MHCAN: A New Regime with Pleich gone as Executive Director? Report from the state Union of the Homeless and upcoming Stockton/Sacramento protests.